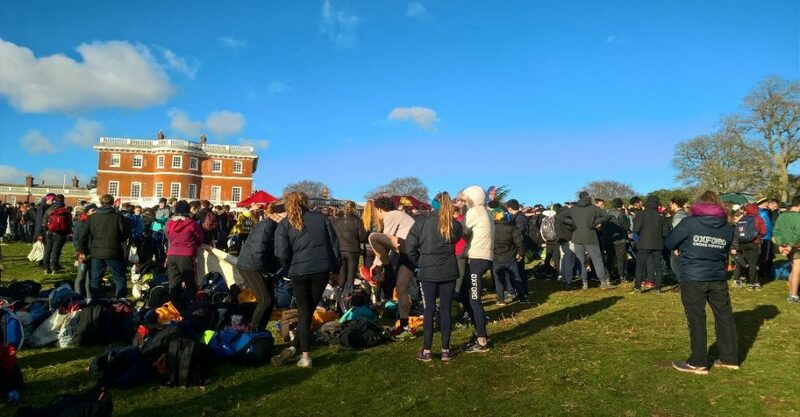 Full results from the 2019 Neptune Teddy Hall Relays can be found here. 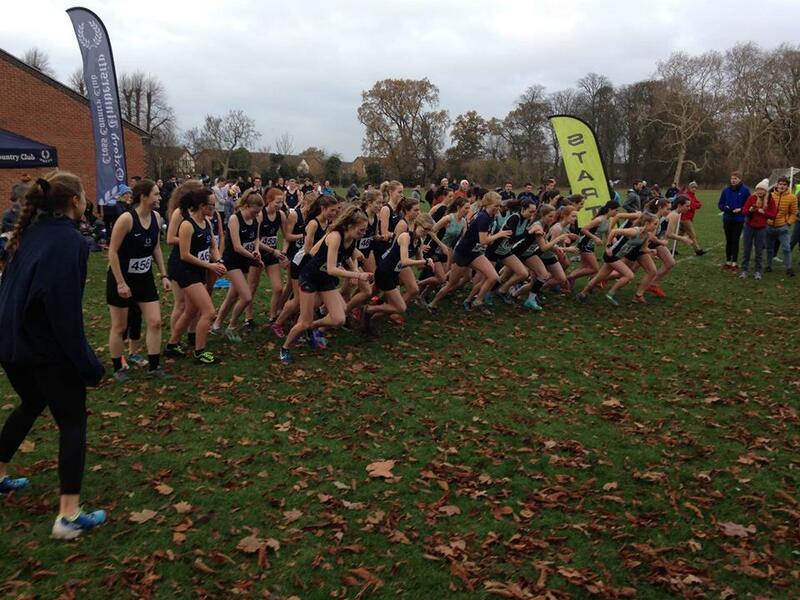 Welcome to Oxford University Cross-Country Club, one of the University’s Full Blue sports. OUCCC caters for those who just like to run socially to athletes competing at a national and international level. 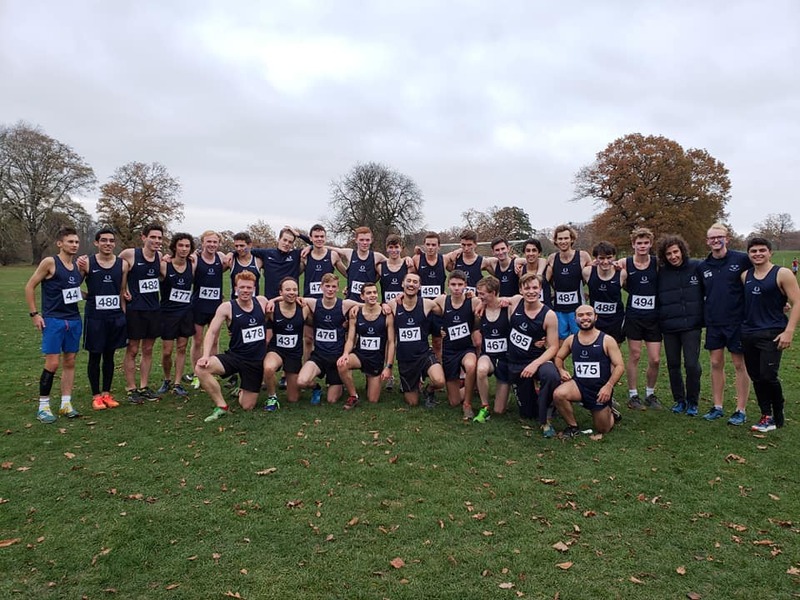 In Michaelmas and Hilary terms we focus on cross-country, while in Trinity Term we join with our sister club, Oxford University Athletics Club (OUAC) and compete on the track. 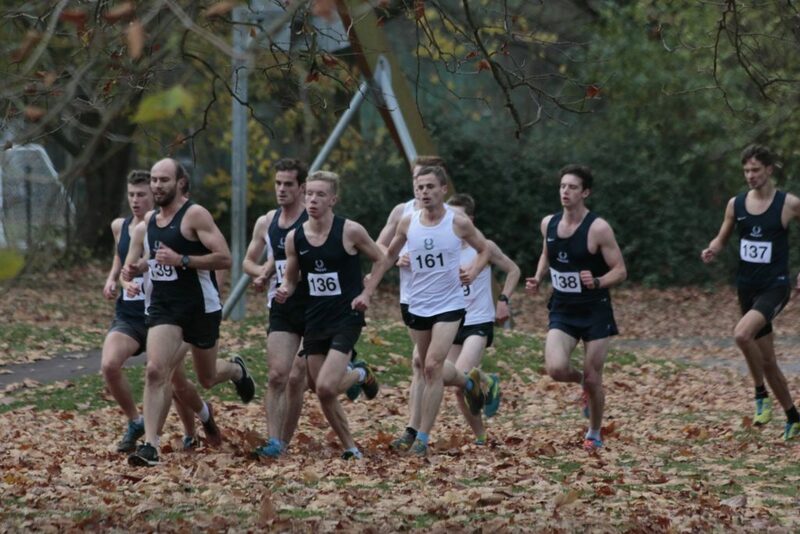 Highlights of the club year include our Varsity Match against Cambridge, BUCS (British University and College Sports) Cross-Country Championships and inter-university relays. These fixtures are open to all, whether you are aiming for a Full Blue or a fun day out. OUCCC is proudly sponsored by Neptune Investment Management. 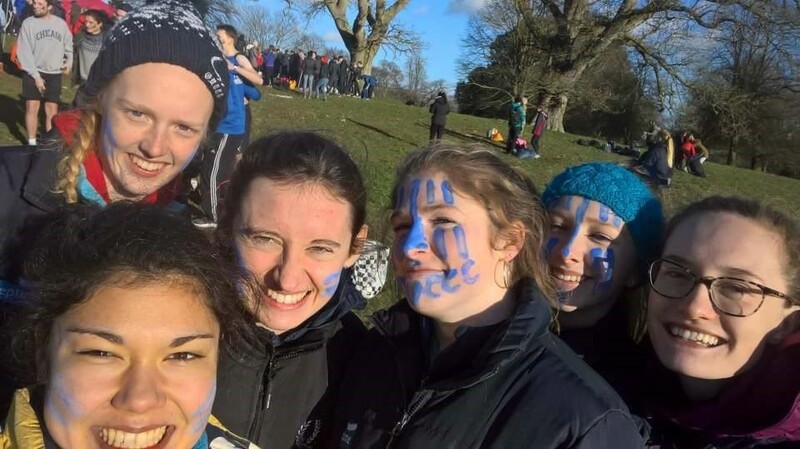 “After speaking to BUCS yesterday they confirmed that the event is still going ahead” – the update from the BUCS XC Facebook group was like music to the ears, allowing the all-encompassing pre-BUCS excitement to keep escalating. Tilly misses her first ever lecture in three years to join a group of eager Friday-day BUCS travellers, the majority of which, we soon realised were members of South West origin. Said members analysed the best service stations in the West Country, while Jamie P (cheers drive) made headway towards an increasingly snow-less Exeter, trying to catch up coach Kyle (from here on ‘KB’) with an upbeat playlist strumming along in the background. 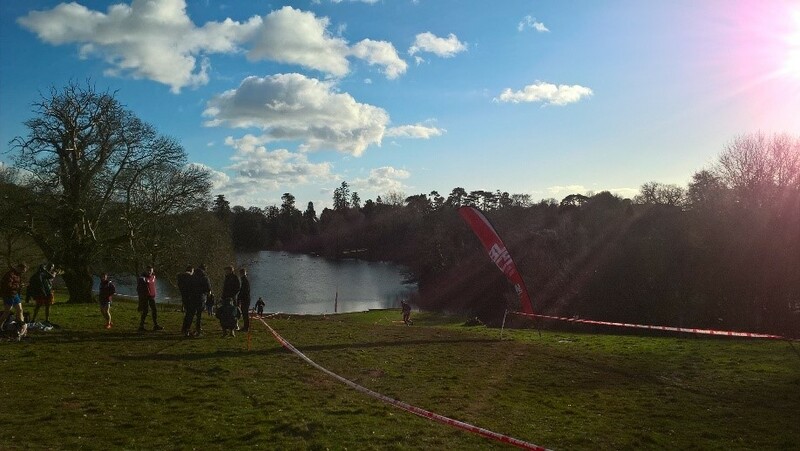 The rest of the squad left the following morning at a spritely time of 5:50am, and in the blink of an eye, traded a snowy Oxford for a sunny race venue at Bicton College, Exeter. 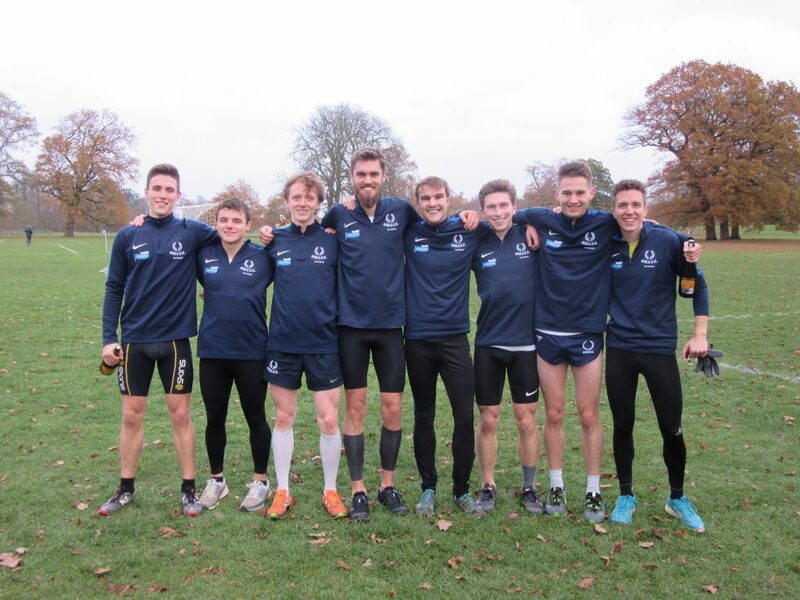 “We created our own lane so they can see our drive” (*drive for BUCS medals) – KB; a moto fit enough for us to realise how we’re part of something special: Oxford Distance Project. 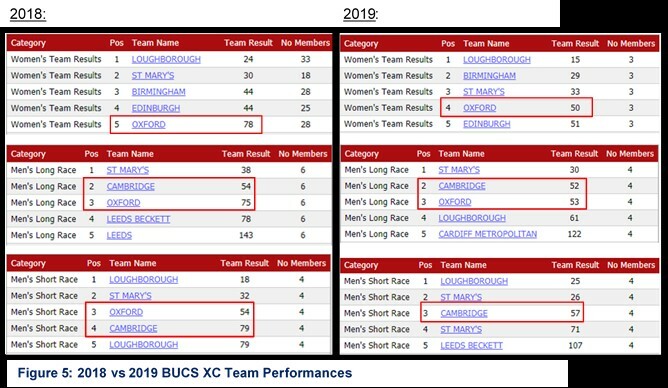 A club which is going from strength to strength: smashing gender parity for university sports teams and making Oxford Sports Fed’s mouths drop with the number of entries required to be manually entered for the 2019 BUCS XC campaign. A record of 70 entries, 37 men and 33 women, reduced to 27 and 22 only through illness or injuries. The latter was not however, about to stop the following mighty squad of Dark Blue supporters (Figure 1): Lucy.W, Belinda, Evie, Hoogsta, Lucy.F, Hannah, PG, Liam, Christian Smith and Eoghan from coming, meaning OUCCC was out in force, a now restored 60-strong contingent with KB + special guests (family, friends, alumni and Holly Hammett). 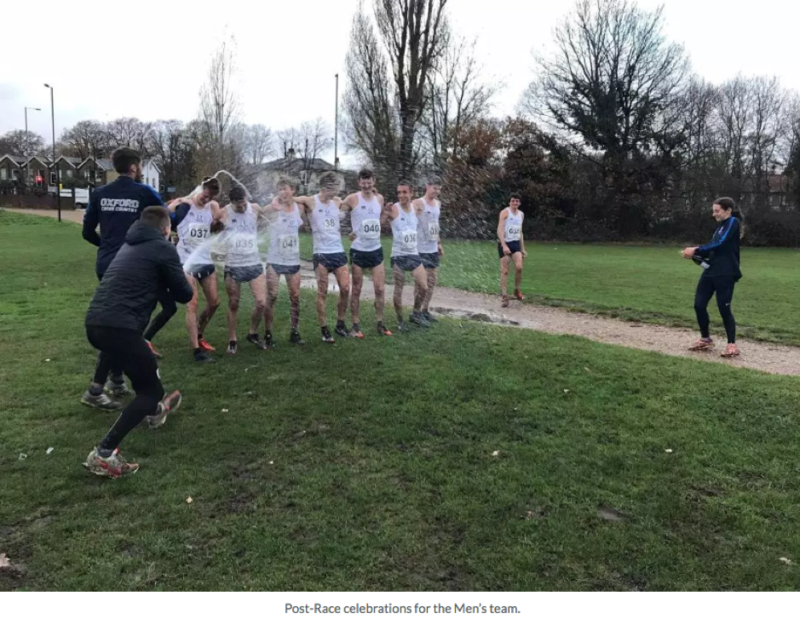 “Cambridge and Oxford have benefited when Birmingham and Loughborough have faltered… Oxbridge universities will be ready to pounce should the third of the big three fall next time out” – FastRunning Magazine’s BUCS Cross 2019 Preview. Little did FastRunning know that other universities outside the heavily sports-funded ‘big three’ universities also had Ctrl-F + “BUCS…” returning big hits on weekly emails and social media pages (shout-out to ODP and intergender Facebook Messenger groups: you’ve revolutionised the meaning of Facebook). Even vocal reminders of #howManyDaysTillBUCS could be heard serenading the start of the first rep at club sessions. KB prepared the squad by crafting BUCS-esque #HillyLoop circuits round South Parks, by getting us to practise the fast (MASS) BUCS start, a true art, and by ensuring we all got our individually-appropriate pre-race tapers in. 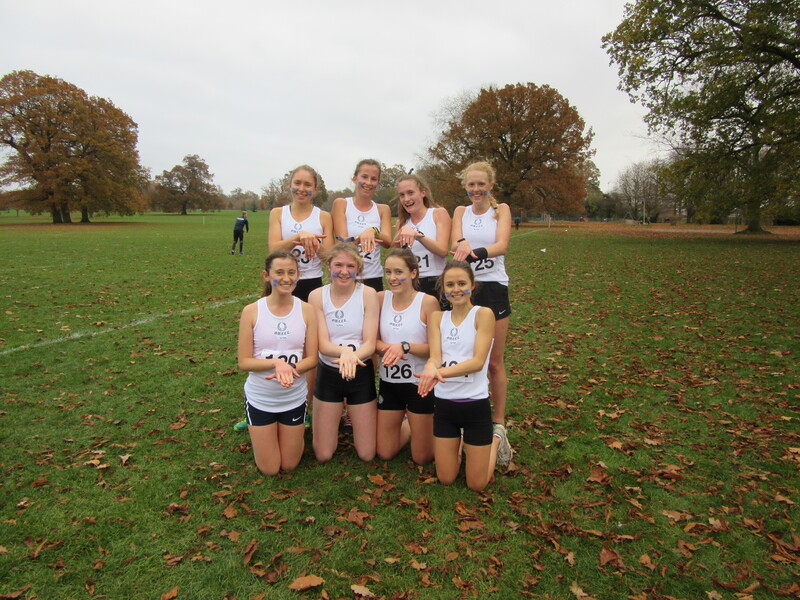 Our race prep was strengthened by run-outs at the Chiltern League and through some especially impressive performances at the regional champs the weekends before. This served to boost team morale and confidence where ‘to dream of where the medals live’ was something now carrying abundant factual evidence. This year’s BUCS course embodied the ‘best of British cross country’: pitched over four fields with a mix of shallow and steep inclines, where tight turns and narrowly taped sections tested our agility, where patches of tufty terrain and muddy-to-get-moshy patches tested our balance, and importantly also, our abilities to wisely seek out our #ownLanes. The best bit of the course (Figure 2) was the route to the finish line, which was, by both physical and emotional definition an endurance-themed rollercoaster. 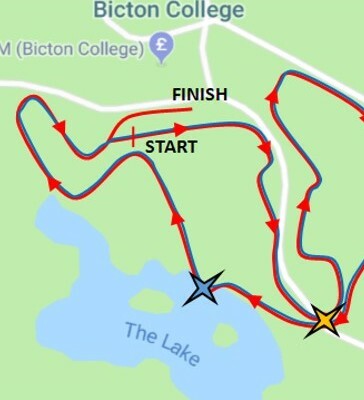 Imagine a downhill 100m segment towards a water feature (Bicton College’s LAKE) with ‘optional’ crossing potential (Clairo; let us never forget; Figure X, end of report), then, suddenly, a 90 degrees right turn bestows unto you a sharp 80m hill sprint where roaring spectators create an echoing channel to keep you moving upwards, just like the infamous L’Angliru climb in Asturias, a breath-taking final stage to the annual Spanish cycling tour La Vuelta (https://www.youtube.com/watch?v=mFHznUIur88). The appropriately named “Sonya’s Hill” (Sonya Ellis, Exeter Uni’s Head Athletics Coach and BUCS course director) was a multifaceted beast; the hill’s peak (Figure 3) was U-shaped meaning before you had time to take a level stride you were hurtling down an even steeper descent and scrabbling up a zigzag camber to the finish line, with legs swimming in lactic acid and a Heart Rate of (220 – – age) bpm. The course lent itself to premium spectator coverage which meant OUCCC TV was as on-point and live as ever, raking in the views back home: “Allez les Blues”- Speed, 3:19. Thank you Woodsy and Charly D for livestreaming to the world how OUCCC took on the three BUCS races. I’ll never forget the genius cheers from that legendary Northern accent: “Come on Eleanor you’ve got this….there’s a tab right behind her! Come on Charly D give her the shoe!” and “come on Millar, come on Lickey Lickey…you’ve gotta keep going mateee” and my personal fave “come on Flo you want this…IT’S BUCS”. Here’s a second moment to shout out to all the OUCCC members who came to support despite being side-lined through injury. You guys contributed to the BUCS experience and your cheers will forever be present in our individual and team finishing positions, next year you’ll hopefully get to see this yourselves. 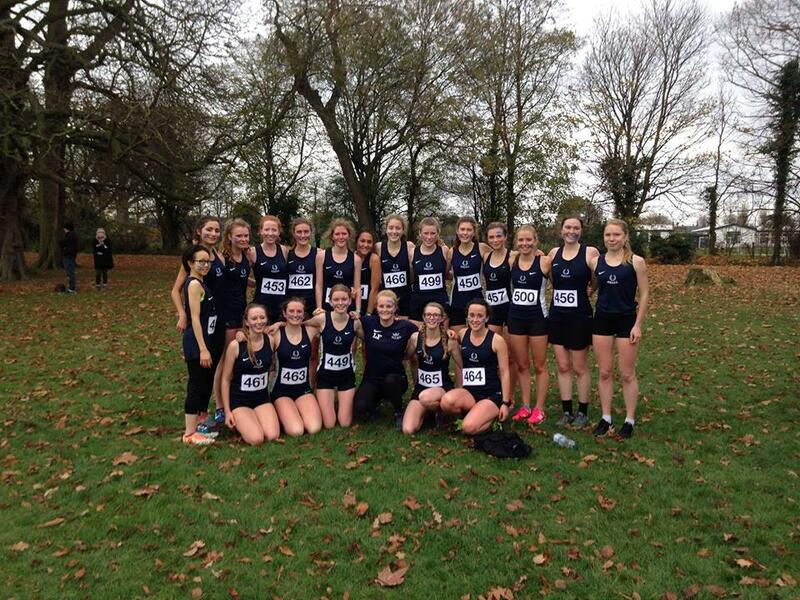 Oxford Women became the 4th best British University XC team for the 2019 season, finishing behind the ‘big three’ aforementioned sporting Unis with 50 points (counted by first three scoring positions). This bettered their 5th place with 78 points from last year. Individually, Eleanor Bolton continued the obliteration of her winter season (4th at Varsity, 1st at Northern’s) by leading the team home in 10th place, the highest individual finishing position to date?! Charlotte Dannatt (2nd at Varsity, 5th at Southern’s) also had an incredible run finishing 14th in what has got to be the most competitive BUCS field ever. Important to note is how Eleanor and Charlotte ran side by side for most of the race, recreating the productive #packing seen in recent training sessions. Flo Scrafton completed the scoring team in 26th, sandwiched by Tabs (who likes bread anyway?) in her 4th BUCS appearance. Anna Sharp finished 32nd in one of the most impressive results of the day (throwback to previous years shows off her progress: 243rd in first year, 89th in second year). 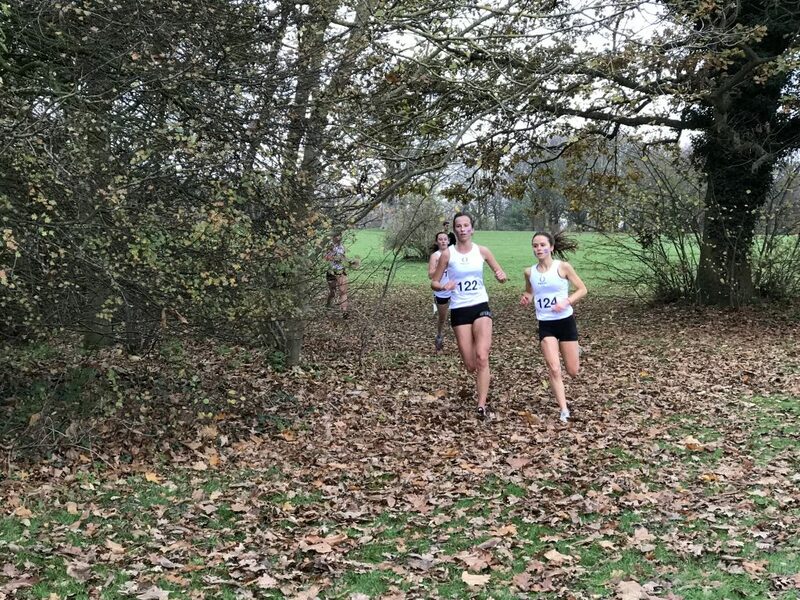 Cecilie finished a superb 78th, Natalie 94th and Tilly 171st – all three securing BUCS XC PBs while Club Captain Helene (ref: Storm Helene; Figure 4) also dipped into the top 100 for the second time, but in a race with 642 starters this was cracking stuff. 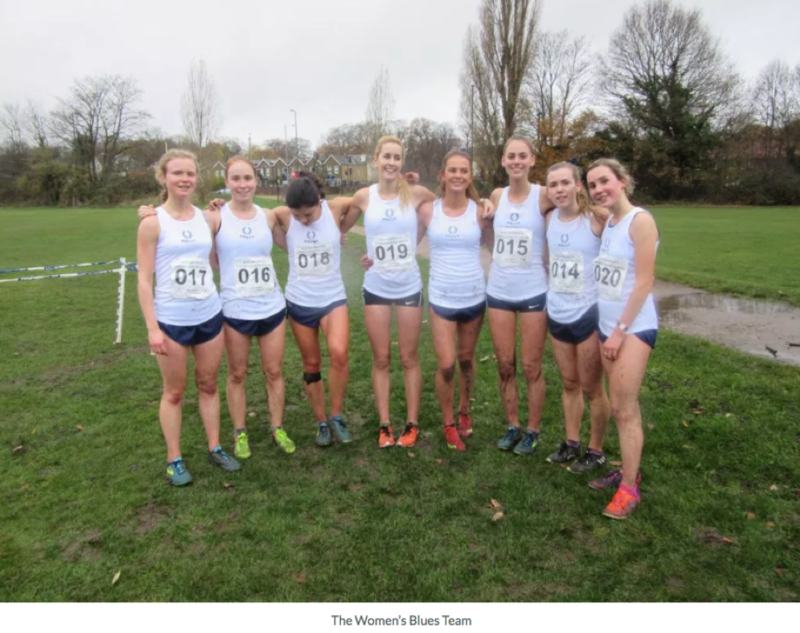 A final mention goes to recent alumni and now GB international Dani Chattenton who finished 7th place, an awesome achievement, where her progress through the years (30th last year, 92nd at her first BUCS) highlights the classiness of this ex-Dark Blue athlete. Is that, wait no, surely not, again? 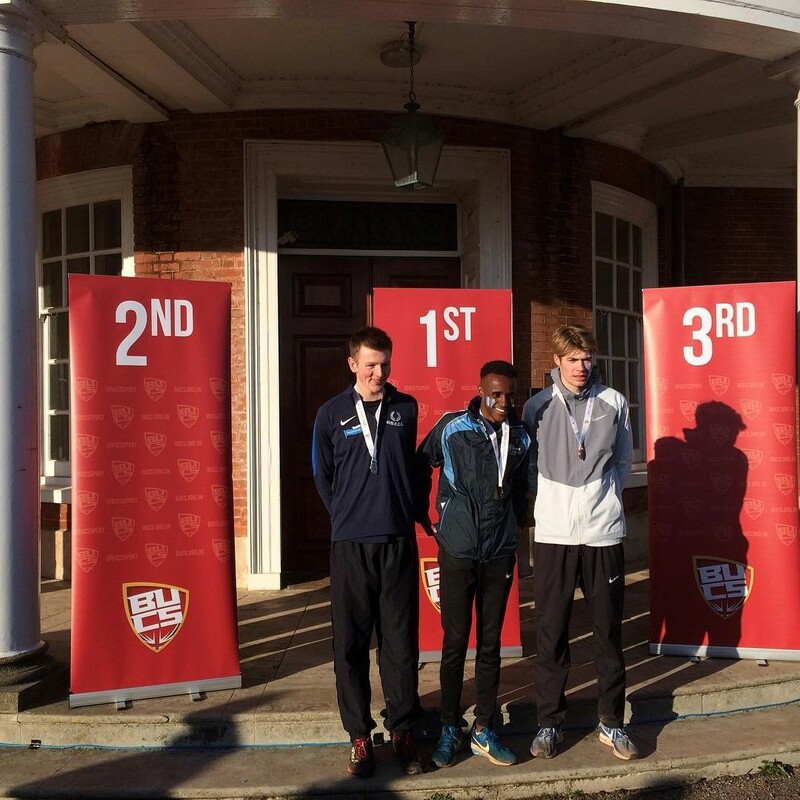 Oxbridge 2nd and 3rd podium positions? 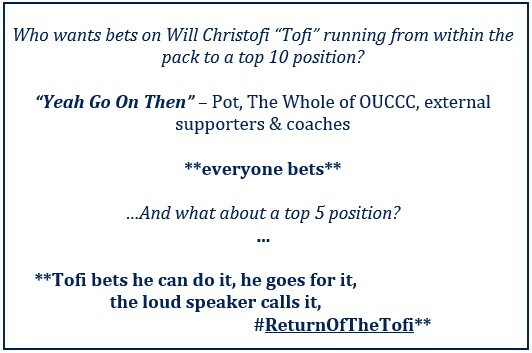 One hates to say it, but the order went: Cambridge in 2nd with 52 points (first four scorers) then Oxford in 3rd with 53 points (Figure 5). However, with Loughborough placed in 4th with 61 points and Birmingham in…please visit the link below for this information as it was beyond the scope of this report, the faith must surely be restored for an accurate prediction and fair credit distribution in next year’s BUCS Cross Preview. 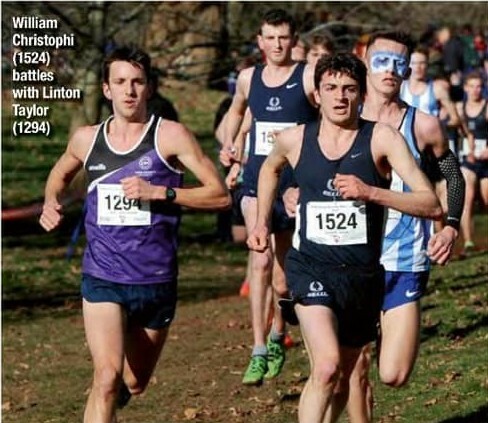 Christofi returns to BUCS to lead Oxford men home in 4th, the highest individual club finish in recent times while Jack Millar secured the club another excellent top 10 finish in 8th position. Jamie Parkinson ran strong for 15th and Tim Harrison completed the scoring tally in 26th, managing to hold on after showing unmatchable dedication to the “BUCS fast start”. Luke Cotter and Oliver Paulin both finished close behind in 36th and 37th positions where again the sights of #packing and teamwork were so inspirationally present throughout. Big congrats to all six guys for bagging the club some more silverware! Noah had been demonstrating increasingly meaner form over the last few months (debuted for the Blues at Varsity) and in incredibly cool fashion, over a course fit for a Cumbrian, never ever looked back until crossing the line in 2nd (just to see th satisfying gap created), Figure 7. Oxford men’s B team finished 8th overall with 125 points (four to score). The team comprised 21 members with eight finishing in the top 100. Robbie Brown was the next Oxford scorer in a very promising 29th, followed by American visiting student Kenneth Marshall in 38th and Joe Morrow in 56th. Another notable individual performance was Joseph Dugdale finishing 4th! Figure 8. After the medal’s ceremony presented by British distance legend Jo Pavey and the last round of team chants about Oxbridge lacking social skills and how Loughborough can’t do admin, OUCCC broke away for some down time before the big night ahead. OUCCC’s Best ever Social Sec Tim Harrison lived up to his own high standards by taking us to dine at Zita’s Smokehouse. The setting was perfect, smokey satisfying flavours and thick cut chips with pitchers of beverage proved hugely moving for OUCCC’s Woodsy. Next stop, Spoons. Imagine a Spoons Empire, this was their HQ and we and several other Unis including The Tabs were weary, beer-goggled and parched travellers who stumble across an extraordinary discovery. Like a reduced version of the ‘wow’ people feel when they trek up the Peruvian Andes and spot the ancient ruins of Machu Picchu. All this Spoons tucked just a stone’s throw away from OUCCC’s very welcoming and excellent weekend residence, The Great Western. “The events that unfolded over the following hours (until 5am for some) are of course far too extensive to detail in their entirety here” – BUCS Cross Report 2017… but highlights this year were: the extra hill reps put in just to get there; the first impressions of the venue being another lit Student Union, and the new or re-establishment of relationships between our present and former Club Captains with some of Cambridge’s finest athletes. However, the initially perceived ‘beautifully busy scenes’ were conducive to shoulder joints being displaced, teams getting stuck in the sludge or fed to the moshpit or sliding around the edges of the dancefloor in spilt sins. The playlists in the two dance rooms were not really up to OUCCC (potentially too high?) standards but given the class A company of the squad it was impossible to not enjoy it, and for some, the pure joy of cracking open a cold one with (or all over) the boys got seriously lit. The following morning a small group of better-for-wear athletes made it out for an inspiring long Sunday run, while the rest of us slept in or made the most of the hearty elaborate food for a 3-hour breakfast session. Without pre-warning the coach driver turned up 30 mins early (or 1.5 hours early for some who weren’t aware – apologies) and kicked up a grumble in his smoking hot coach. We arrived back to Oxford in great spirits, with blurry eyed and DOMS from a 24 hour stint to be very proud of. Thanks to Great Western Hotel for hosting us, to the committee for organising, to to Kyle for making the trip up to support us at another memorable weekend for the OUCCC. 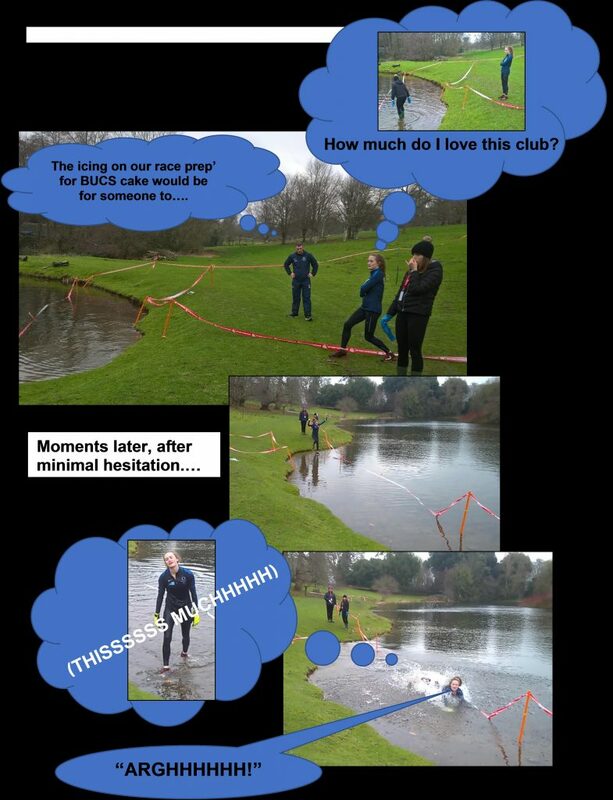 Lastly, thanks to all you Dark Blues who participated in any aspect of the big BUCS weekend… BUCS XC 2020 anyone? 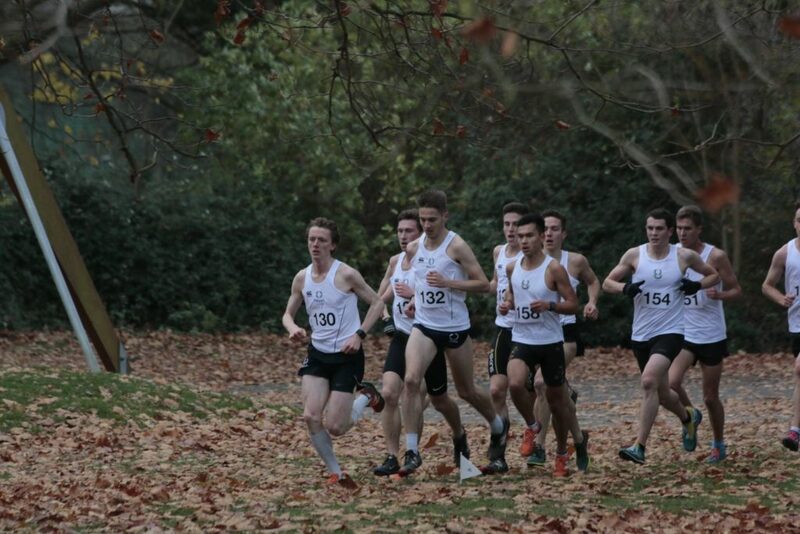 On the final Saturday of Michaelmas, the Oxford and Cambridge cross country clubs descended on Wimbledon Common for the Cross Country Varsity Match. The action for the day kicked off with the traditional ‘old gits’ races. Former OUCCC Club Captain Miles Chandler warrants a special mention for storming to the top spot in the Men’s race, although Cambridge took the overall victory 91-158 with their strength in numbers. In the first of the Varsity matches for the day, the Blues women took to the course to tackle a grueling 4-mile loop. This race was the first where the women competed with teams of 8, up from 7 in previous years to match the numbers in the men’s race. Both blues races are just a single lap, which makes it incredibly difficult for spectators to see all the action so we got reports from runners in both races to see how they played out. Cambridge were announced the winners in the women’s race (46 -33) but that should take nothing away from one of the strongest women’s teams Oxford have fielded in recent years. A special mention must also go to our contributor Charlotte for her outstanding run which landed her a silver medal, as well as Eleanor Bolton who overcame the heartbreak of being blues reserve last year to finish 6th and be the second Oxford runner over the line. 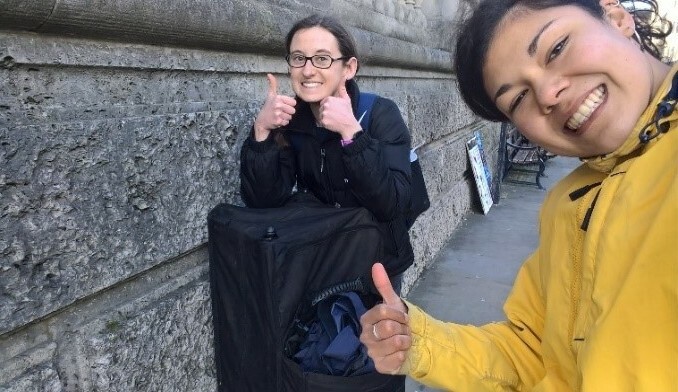 The Oxford depth was also outstanding with Alex Shipley, Flo Scrafton, Anna Sharp, Laura John and Hannah Plaschkes all packing well and completing Oxford’s scoring team before Cambridge’s 6th runner – unfortunately, Cambridge had done the damage with 4 of the first 5 runners in. This incredible performance meant Oxford had managed to get all 8 of their team across the line before Cambridge’s scorers (first 6). The 50 – 30 scoreline is a testament to the high-level performance of the men’s team this year and, of course, sealed the Overall 4-3 Varsity Victory for the club. This capped off a fantastic series of races and, although we seem to say it every year (because the standard just keeps on improving), the standard of this series of Varsity matches was among the highest anyone at the club can recall. We’d also like to thank our sponsors Neptune for helping us over several years to make events like The Varsity Match possible. With the first of the two Varsity weekends finally upon us, all eyes were turned towards the Oxford II-IV’s teams on Saturday 24th November, as they took on the Tabs across the grassy plains of Priory Park, St Neots. However, as all runners prepared to set off from the city of dreaming spires, whether the athletes would even make it to the start line had to be called into question as one of the coaches failed to make an appearance on the day. Fortunately, the trusty X5 came to the rescue and ensured that everyone (well, almost) made it to the penultimate stop on this most famous coach route. The day’s racing action kicked off with the 36th Ladies Seconds’ race at 12:30. 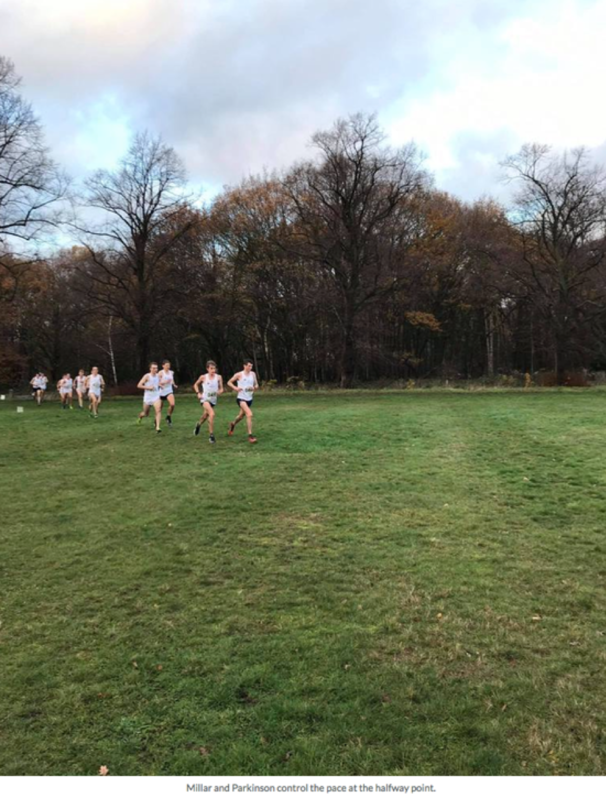 Visiting student Caroline Shipley showed her fine American cross-country running pedigree, featuring at the forefront of the leading pack from the early stages of the race. Caroline and Cambridge’s 2015 Blues victor Emily Ruane broke away from the rest of the runners on the second lap of the 5.5km course, with Ruane ultimately taking the individual win, and Caroline coming home second. Cecilie Andersen led in the rest of the Oxford women with a gutsy run, albeit slightly adrift of a large Cambridge pack. Cecilie’s performance was all the more commendable when you consider the fact that she had been training and racing with a broken wrist! Despite her lack of spikes, South African fresher Celeste Renaud was our third Turtle home, with Team Captain Hoogy just behind. Whilst there were some great runs from the Oxford Turtles, we were ultimately beaten by a stronger Cambridge team, of which half were former Blues runners. Next up were the Tortoises in the 75th Gentlemen’s Seconds’ race: the most hotly anticipated race of the day as per some, and it most certainly did not disappoint. There was nothing between the two teams on the first lap as a huddle of white vests seemed to make its way in perfect formation around the outskirts of the park, weaving in and out of the woods. The field began to break up on the second lap, with OUCCC Men’s Captain, Oliver Paulin ramping up the pace all the way and remaining at the very front of the race. Things were looking good for the Tortoises, especially as Team Captain Aidan continued to make his way further up the field. On the last lap of the 10.3km course it became clear that it was going to be a fight to the finish line for the individual crown with Paulin and CUH&H’s James Coxon neck and neck. Paulin ran an impressive race, finishing as Top Tortoise and winning the prized plate in the process, but lost out on the overall race win by a mere second. Kirk Smith crossed the line in fourth place overall as second Tortoise, leading in a strong Oxford pack of Smiths, broken up nicely by Williams’ visiting student Ken Marshall. Ken was fifth, Liam (Smith 2) sixth and Aidan (Smith 3) seventh. With five Oxford runners in the top seven, Paulin was adamant that the Oxford men couldn’t lose. And once the scores had been added up and a 36-42 Tortoise victory announced, he made sure to make a quick exit to avoid the ensuing well-deserved champagne spraying. Five minutes behind the Tortoises, the Oxford Snails were off in the 68th Gentlemen’s Thirds’ race, leaving spectators and OUCCCTV lead commentator Luke Cotter running between both groups of runners in an attempt to not miss out on any of the excitement. Another closely contested race, Robbie Brown earned himself the title of OUCCC Super Snail, as well as the much-coveted plate too, crossing the line in 3rd place overall. Positions five through eight were all filled by Oxford runners: Tom Quirk, Christian Smith, Yannick Markhof and former tab turned dark blue Joe Bowness. 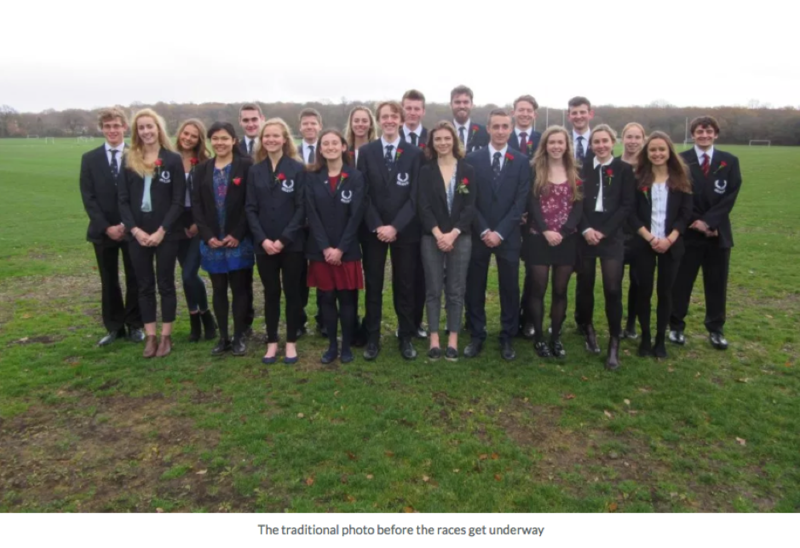 Although all of the Oxford runners ran extremely well, with finishing times that would not have been out of place in the Men’s Seconds’ race, they narrowly missed out on the overall Thirds’ title. With the Men’s Thirds being the only race that Oxford lost last year, you can rest assured that the Snails will be back stronger than ever before over the Shotover course in 2019. The penultimate event of the day was the 32nd Ladies’ Thirds’ race, and the first of the two Mob Match races. Thanks to Mob Match Captain Jenny’s valiant efforts at galvanising the Oxford girls, we had more dark blue runners on the start line than the Tabs did, which at an away Mob Match is already a victory in itself. The Oxford women dominated the race from the get set go with Natalie Beadle and Egle-Helene Ervin marking themselves out as early race leaders. Natalie stormed to the overall victory in a time that would’ve seen her figure in the first half of the Ladies’ Seconds’ race, and second place went to Egle. Natalie Haarer, Leah Tillmann-Morris and Annabelle Evans completed the Oxford top five, finishing fourth, sixth and eighth respectively overall. The race was nothing short of a tremendous triumph for OUCCC with the final score being declared as a 346-556 Oxford win. Finally, it was the turn of the Mob Men in the 61st Gentlemen’s Fourths’ race. Yet more persistent recruiting, this time from Mob Match Captain Peter Guevara, along with his truly inspiring American-football team style motivational pep talk, ensured that a large Oxford team was ready and raring to take on the Tabs. Oxford’s Thomas Renshaw took the individual race title, backed up by Charlie Sneddon in second place, producing a repeat of the Oxford 1-2 finish we saw in the Ladies’ Mob Match. 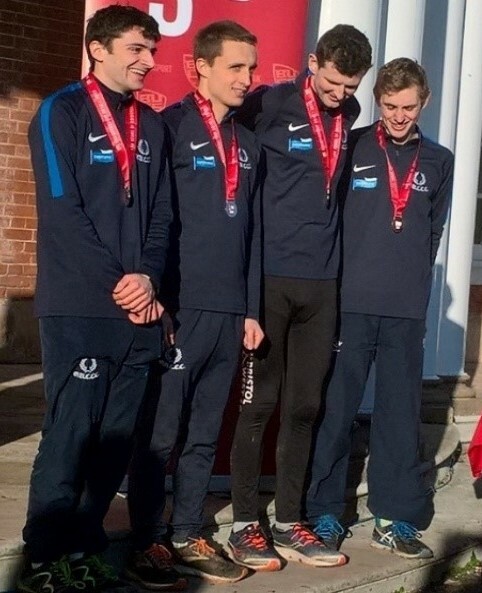 Joseph Grehan Bradley, OUCCC’s Marathon rep Rahil Sachak-Patwa and Ben Passey closed out the Oxford top five in overall places fourth, fifth and seventh respectively. The somewhat complicated Mob Match scoring system makes tallying up the points, whilst spectating and supporting, tricky for even the most talented of Oxford mathematicians. Everyone was waiting with baited breaths to hear the outcome of the race and fortunately we were able to celebrate another Oxford victory (943-1066). We're all just batteries really, aren't we?